A considered approach to surface choices, coupled with a fine attention to the smallest of details, ensures this black-on-black, contemporary kitchen shines out in its architectural surroundings. Designer Nicola Ross from Mastercraft Kitchens by Healey in Palmerston North had previously worked on four kitchen projects with her clients, Marie and Matt Henry, so when it came to designing a fifth for their new family home, she had a pretty good understanding of what they both wanted in terms of style and functionality. Getting on board early with the design and the spatial planning of the kitchen, before the working drawings had been finalised with the architect, meant that this part of the house could be adapted to accommodate Nicola’s scheme – in particular the appliances, feature open shelf and concealed entry to scullery. This also helped the kitchen fit in with the home’s internal architecture. Nicola says that although her clients asked for a black kitchen, she didn’t want it to look plain, “black on black”, so she introduced texture to the large surfaces, to help break it up and to add visual interest and dimension. 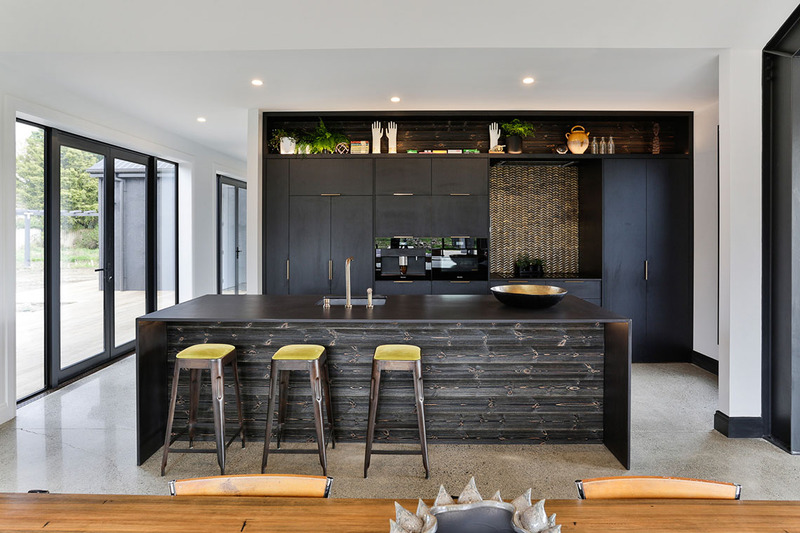 “For the island and the benchtops, I chose hard-wearing Dekton in a leathered finish, and for the cabinetry, a pre-finished timber veneer from Laminex, called Nero Fino. Both these materials have a matte finish. I didn’t want anything shiny” she says. Another layer of texture was brought into the material palate by using a blackened timber planking feature, inset into the front of the island and as a backing to the open shelving above the cabinetry on the back wall. “It’s antique spruce with a brushed wax finish, from a company called Vidaspace,” says the designer. A further splash of colour – a vibrant yellow (Resene Galliano) – was introduced inside the cabinet above the oven and coffee machine and repeated on the splashback and on the cupboard and drawer handles in the scullery. This subtle and clever use of texture and colour has resulted in a stylish, functional and beautifully coordinated kitchen and scullery that Nicola’s clients absolutely love. Nicola also designed the laundry, bathroom and spacious walk-through wardrobe in this home, demonstrating how attention-to-detail bespoke cabinetry can go way beyond the confines of the kitchen, and into these more functional spaces. This kitchen recently won the NKBA (National Kitchen and Bathroom Association) Wellington Chapter Kitchen Recognition Award 2018. For more inspiration order a copy of our Look Book. To order your FREE copy go here. This kitchen was proudly designed, manufactured and installed locally by Mastercraft Kitchens Palmerston North.